Michael John Bench was born in Birmingham in February 1926 and died in the Royal Cornwall Hospital in Truro on 18 June 2009. My earliest memory of Michael is of a visit with my parents and brother to my great aunt Millie and her husband Horace (Michael’s parents) at their home between the church and golf club at Harbourne, a suburb of Birmingham, in about 1950. Michael was always warm, friendly and welcoming in common with all of the Bench family. I can remember, vividly, David and myself being taken by Michael to the large garage to see his pride and joy – a wooden clinker built sailing dinghy, which later knowledge tells me was probably a National 14. It was the first boat that I had seen at close quarters and it instilled in me an excitement that I have always felt and still feel for small craft. Michael had an infectious enthusiasm which characterised the whole of his life. He was, at that point in his life, an architectural student in his early twenties and his subsequent career carried him up the ladder of the buildings department of the NHS to become its assistant head at the time of his retirement. 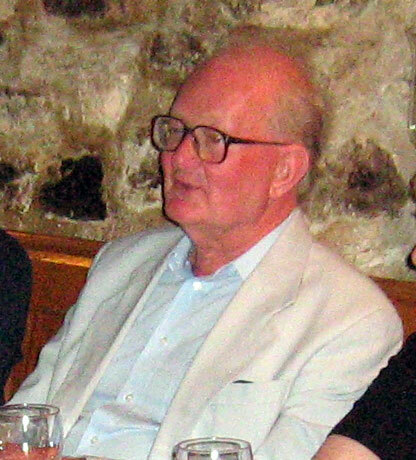 Much of his spare time was filled with a passion for the architectural and cultural heritage of Hampstead and Highgate, where he spent most of his life. On Thursday 11 June 2009, Michael and his sister Mary, both well into their eighties, shared the driving of Mary’s car to Polzeath in their beloved north Cornwall. This was a journey of both nostalgia and reunion, since they met up with myself and Elizabeth and one of my daughters, plus my brother with one of his daughters and her boyfriend. We had planned a meal at St Kew Inn for Saturday night, to be followed by a barbeque at Blisland and possible sailing at Falmouth. The first of these, dinner at St Kew was a hugely enjoyable event and Michael was the life and soul of the evening, sitting next to Elizabeth and regaling us all with stories and reminiscences. We left the inn that night looking forward to meeting again during the next few days. Elizabeth has written her own account of the happenings at this time here. Sadly, that evening was Michael’s last social event. The next day, after a late lunch, he and Mary took the car the short distance to Polzeath beach, where Michael had decided he was going for a dip in the sea. He put on his bathing trunks and leaving Mary sitting on the rocks he set out on the long walk across the tide exposed sand to the water. No one is quite sure what happened next, but gradually Mary became aware of lifeguard activity, including a four wheel drive vehicle speeding across the sand. As the minutes ticked by and Michael did not reappear, she had a sinking feeling that he must be the one in trouble. By the time Mary got to the waters edge, a crowd had gathered and there was all the activity of people coping with an emergency. A lady approached her and asked if she was possibly the wife of a man in blue swimming trunks. Having established that Michael was actually Mary’s brother, she was helped to be near him as the lady’s husband, a local GP carried out CPR. 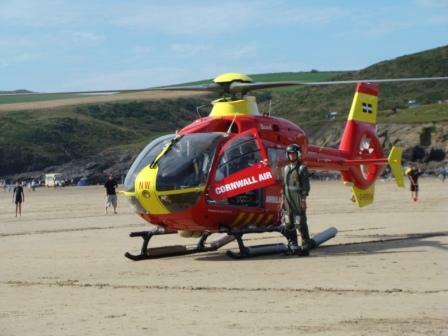 The Cornwall Air Ambulance circled and landed on a cleared spot on the beach nearby and lifeguards, paramedics and the GP moved Michael swiftly and carefully into the body of the helicopter. As the aircraft took off for Truro, Mary was assisted back to her car and the kind lady who provided so much help drove her to the hotel. In the meantime, Mary had alerted my brother, daughter and myself and we set off to meet up at the Royal Cornwall Hospital. A & E.
The prognosis was not good, Michael’s brain had been starved of its supply of blood for about fifteen minutes. Even in someone considerably younger than his eighty three years, that would be serious. He was breathing uncomfortably when we first saw him and showed no signs of being aware either of his surroundings or his family at his bedside. The medical staff at Treliske continued the detailed and caring treatment that Michael received right from the time of his collapse to his death. At all stages every effort was made to keep those of us awaiting news updated and informed, both of the progress and prognosis as the night developed. Michael was taken for a brain scan which confirmed the suspicion that serious damage had taken place. At this stage I would like to offer praise and thanks to the air ambulance crew and all those who played a part in Michael’s rescue and treatment. He was given the best possible chance to survive and recover, albeit at an age and in circumstances that made those two things extremely difficult. I would also like to mention that both the RNLI Lifeguards and the Cornwall Air Ambulance are supported by voluntary donations and I believe that it would be a fitting memorial to Michael if his friends and family contributed generously to both charities.